In an effort to boost fuel economy and increase towing capacities, some auto manufacturers have turned to using lighter building materials. This means repair shops have had to adapt. Shops who are not up-to-date on the latest materials and technologies may not get the important distinctions between steel and aluminum. Through a lack of understanding and proper working materials, technicians in these shops may cause more harm than good to your car, truck, or SUV. The experts at Tucker’s Collision Center understand these vast differences and know how to properly work on vehicles made of either metal. Lack of “Metal Memory” – Steel has what’s known as “metal memory”. This means when it’s dented, there is a potential of reshaping the material back into its original shape. Aluminum does not have this “metal memory”. Often times, when aluminum has been damaged, it needs to be replaced. Minor dents in the aluminum can sometimes be repaired using processes such as Paintless Dent Removal. This method requires specific materials and training. Aluminum and Steel Don’t Mix – Aluminum and steel do not work well together. The two actually become corrosive when in contact. Heat Response – Aluminum conducts and absorbs heat faster than steel. This affects the welding process. Aluminum Specific Technology – Once bent or damaged, aluminum requires aluminum-specific tools to extract dents and reshape the vehicle’s exterior. The industry-leading technicians and on-site welders at Tucker’s Collision Center are trained and equipped to work with steel and aluminum. We take great pride in our quality of work, where the safety of the repair is always paramount. With our expertise in steel and aluminum repair, we always return your vehicle to original manufacturer’s specifications, regardless of building material. Our founder, Rick Tucker, developed the core values of keen attention to detail and exceptionally safe repair work from his award-winning classic car restoration business. These values are evident in every repair job that comes through Tucker’s Collision Center. 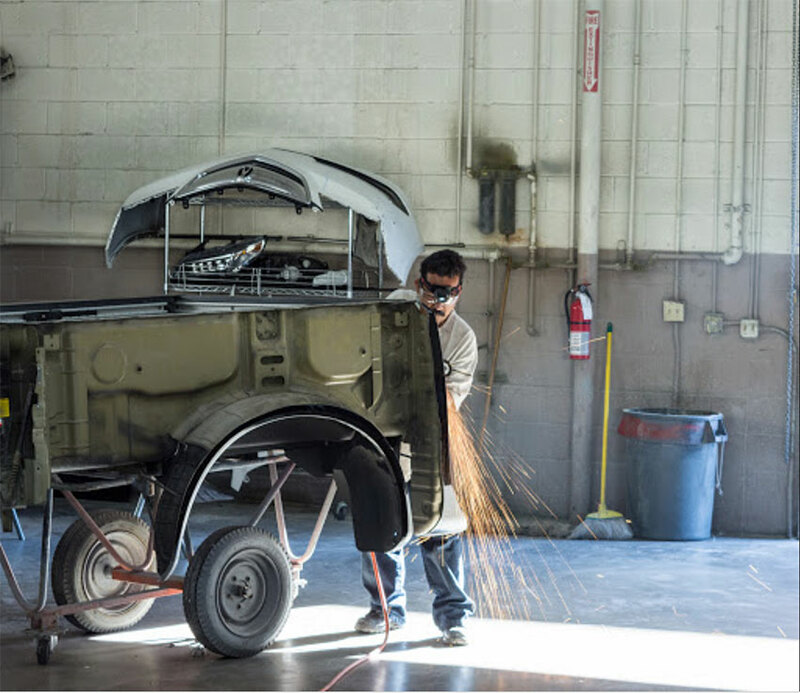 We treat every car in our shop like one of our prized restorations. When you come to Tucker’s, you can trust you’ll leave with your vehicle running and looking like new.